The spirit of New Orleans permeated Brooklyn Bowl last Friday as Galactic planted themselves on the stage for four consecutive nights of raucous musical celebrations. The spirit was alive not only in the brilliant blues, soul and funk music but also in the tireless energy of the performers. If The Stooges Brass Band hadn’t been on deck for the after-party set, Galactic could’ve (and would’ve) gone on well past their two-hour mark. The evening was kicked off by The Dead Kenny Gs, a funk band that leans towards heavy metal and garage rock. Legendary New Orleans percussionist Mike Dillon is part of the rowdy trio, and following their set, he joined Galactic for more revelry. Dillon was only a fraction of the parade of company that helped sustain Galactic’s adrenaline; it became increasingly difficult to keep track of all of the various musicians who joined them onstage, but singer Corey Glover and the stellar Corey Henry on trombone also featured prominently in the line-up. In addition, there was the soulful woman accompanied by four men on bass drums who brought an element of Latin dance to the soundscape, plus the three men who duplicated the trombone and saxophone and added a trumpet to the mix, expanding upon the powerhouse horns already stealing the spotlight. With moments of heavy bass lines, crying harmonicas, screaming trombones and superb vocal scatting, the set was one helluva party. 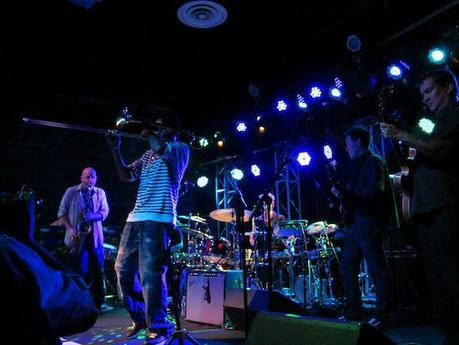 The seven core musicians (up from the band’s normal five) traded solos like a traditional jazz ensemble and left what little chatter there was between songs to Glover. The songs in their repertoire, though not necessarily recognizable to the average listener, had the (particularly inebriated) crowd grooving and cheering in delight. The one stand-out cover was of “I Am the Walrus” on which these New Orleans men pulled out a funk that the Beatles probably never dreamed possible. Then again, when you play like these guys and can command an audience this far from home for multiple performances, the realm of possibilities is endless. Video of the band playing Brooklyn Bowl back in 2009 below.